Published: June 12, 2015 at 10:21 a.m. Updated: June 12, 2015 at 01:32 p.m. The health of Jadeveon Clowney hovers over the Houston Texans defense like a dense fog. If the former No. 1 overall pick is healthy after last year's microfracture surgery on his right knee, the Texans will boast an uber scary defensive front with Clowney, J.J. Watt and Vince Wilfork. If Clowney remains hindered or off the field, it's another blow to his future and reduces Houston's dynamic ability. Coach Bill O'Brien told NFL Media's Michael Silver he believes Clowney will be ready for Week 1 after the linebacker appeared in just four games his rookie season. "I think he's gonna be there for the opening game (of the regular season) against Kansas City," O'Brien said. "I think he's going to make it back, and I'm really looking forward to that. He's working very hard to get back." O'Brien is confident his 2014 top draft pick will suit up for the opener, but he's not sure when Clowney will return to practice. 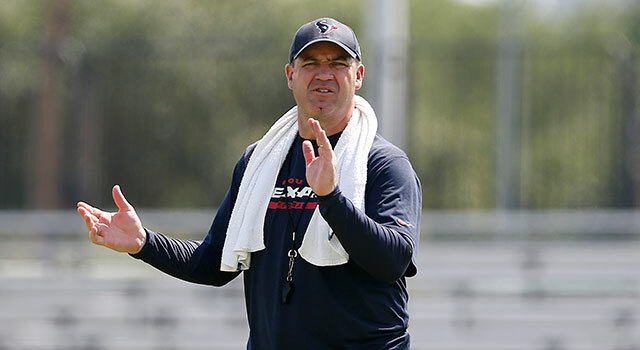 "High expectations," O'Brien said about Clowney to reporters on Friday. "I think the guy has worked hard. When I say high expectations I mean for him coming back and being on schedule to start the season. Now when he comes back to be able to practice in training camp, we don't really know that yet. "Obviously he would have to practice some to be able to be ready to play in the Kansas City game even if it was on a limited basis. But he's worked extremely hard. I think he's moving well, I think he feels better. We'll be looking forward to seeing where he's at once we get back here at the end of July." Getting him ready for Week 1 might be the goal, but keeping Clowney on the field after the opener is vital to the Texans success in 2015.